Teaching Elementary Physical Education 1 Edition Teaching Elementary Physical Education: Strategies for the Classroom Teacher gives elementary education teachers the tools and strategies they need to teach physical education using a skills-based approach. Designed for the non-physical education teacher, the book provides a shorter, more focused presentation of how and what to teach in physical education. Introduction to Elementary Physical Education, Creating an Inclusive Learning Environment, Motor Skills to Children, The Daily Physical Education Lesson Plan, Strategies for Instruction, Strategies for Assessing Student Work, Managing a Physical Education Class: Protocols, Rules, and Accountability Systems, Managing Equipment, Space, and Time, Strategies for Managing Behavior During a Physical Education Lesson, Creating a Physically Safe Learning Environment, Strategies for Teaching Locomotor and Nonlocomotor Skills, Strategies for Teaching Manipulative Skills, Strategies for Teaching Games, Strategies for Teaching Rhythmic Movement, Strategies for Promoting Physical Activity and Fitness, Strategies for Complementing Classroom Work. 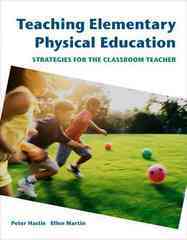 For all readers interested in teaching elementary physical education.